Welcome to La Cucina’s blog and news. We’re here to feed you information surrounding the world of food, the history of Italy, the secrets behind pizza, where to find the best ingredients on earth, and other topics that are pillars of our business. As your local Italian restaurant, we’re proud to provide authentic Italian food; and we’re happy to entertain you with recent information, facts and figures, yarns of yesteryear, and more. So stay posted to learn the latest from La Cucina Italian Eatery. Today, we’ll be talking authentic ingredients. What ingredients are truly Italian? The list is substantial (especially in the cheese department), so we’ll come back to the topic in upcoming blogs. What Italian meal would be complete without artichokes? These plants are part of the thistle family, and the artichoke food itself is actually an unbloomed flower. The leaves of the flower are notoriously meaty and delicious, yet the heart of the artichoke is the most delectable prize. Basil and Italian cuisine go hand in hand. This plant – a member of the mint family – is excellent for preparing sauces or sprinkling over pastas and pizzas, and it can be eaten raw, straight from the plant. Italy is home to a variety of mushroom families, including the porcini and the crimini mushrooms. White-, brown-, and reddish-capped, the porcini mushroom is valued for its fresh flavor. The crimini mushroom, a very common mushroom, is earthier in flavor than its porcini cousin. Again, we’re just starting our list on authentic Italian ingredients that we pour into our pizzas, pastas, and other Italian cuisine. 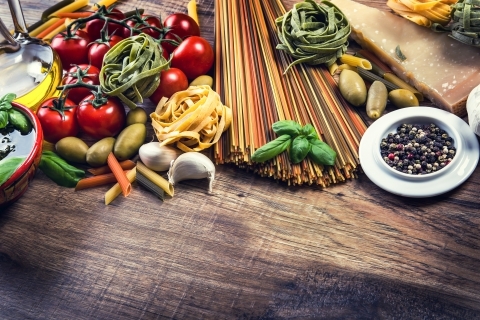 Check back to learn more of the best foods that Italy has to offer.